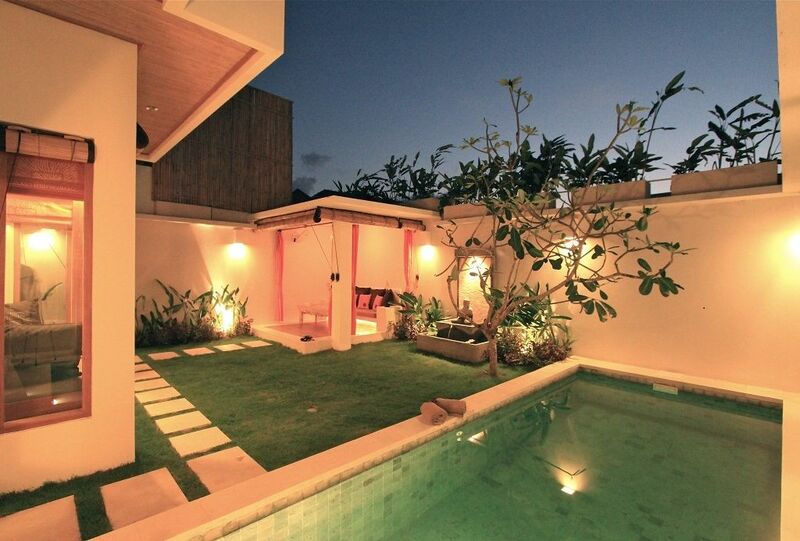 Our Seminyak holiday villa is set up for a family or couple, with air conditioning, a private pool and a garden. This self-contained Bali accommodation boasts a full kitchen, while a multitude of cheap eats and local cuisine can be found within a short walking distance, so you can choose to eat in or out, depending on what suits you best. The master bedroom offers a 43 inch TV 75 channels and a DVD player (with a selection of DVDs), Playstation3, and Stereo HIFI Bluetooth Music -------.--- keep you cool and comfortable, air conditioning has been installed. An additional bedroom, with AC, TV, DVD and double bed 1,4x2m. The extra room is small and 3.5 x 2.4 metres in size. No fighting over bathroom use will occur this holiday, as the villa offers two full bathrooms (with hot water showers). For your convenience, guests are given the following toiletries: shampoo, body wash, tissues, tooth brushes and tooth paste. After long days exploring Bali, relax in the lounge gazebo, or go for a swim in the private pool! And dont worry about getting bitten, as we also provide you with mosquito repellent spray. The kitchen has everything necessary to prepare a feast, down to the slightest detail. Amenities include plates, glasses, cutlery, a coffeemaker, toaster, fridge, gas stove, rice cooker, microwave with grill and a hot and cold water dispenser. When you arrive, youll find the kitchen well stocked in toast, eggs, jam, milk and soft drinks, so you can enjoy a hearty breakfast. These refreshments are accompanied by a welcome snack and complimentary drinking water. Throughout your stay, help yourself to coffee powder, sugar, tea and salt. Your Seminyak villa will always be in top condition, thanks to our 6 day a week cleaning, gardening and pool service. Stay connected with your world while on holiday in Bali, thanks to free wifi. To make your holidays even smoother, take advantage of our free airport pickup service, for stays of 7 days or longer. Alternately, pickup by our driver can be arranged for 15 USD. So now, the holidays can really start! We had a great experience at the villa, super quiet and private accommodation where you can relax completely. The location is great with much more villas around a supermarket around the corner and a bigger shopping centre just 5 min walking, you also can find restaurants, market, Gelateria and much more in approximately 1km walking distance. About the accommodation it’s just fantastic it has everything you need and they even provide more then what you would expect such as snacks and breakfast for the days you stay there, coffee for the coffee machine, few soft drinks and lots of tea and instant coffee for the one who prefer that. Completely recommend this Villa with great location and wonderful staff! The villa is awesome. Requested for some flower arrangements as i was there to celebrate my 7th wedding anniversary. They didnt dissapoint. It was lovely and romantic. The villa provides everything, frm food to little details like mosquito repellant. The guy who helped me checked in, Nengah was helpful. They clean the villa every morning. The downside is the mosquitoes. There’s quite a few! Bt the villa provides mosquito sprays and those burners. Location wise, its abit secluded and the road leading to villa is dark if u travel at night. But its safe as there is a hotel just infront of it. Overall, me and my wife enjoyed our stay at the villa. For the reasonable price, we couldnt ask for more. We will definitely recommend it to our friends and families. Thanks Marco! This villa is a dream! It’s everything we needed for 4 people in Bali. Marco was extremely accommodating and understanding throughout our stay. On our first day of checking in, Marco greeted us and settled us in into the villa. I must say that Marco has thought out everything for us, down to the date complimentary toothpaste/toothbrush in the toilet and kitchen necessities. On our last day, we had to check out late because of our flight timings and Marco really helped us with that. The villa’s location is really convenient and we could book taxis and ride around easily. We will definitely look forward to stay in this villa the next time we’re visiting Bali. Thanks Marco and the team for being just the best anyone can ever need on a relaxing vacation!